When I started to write this post, I went straight to my head. There was catechism and scripture quoting and all sorts of things. After it was written and as I fell asleep, I found myself thinking: where am I in this post? Are these not meant to be meditations on our experience with this? Why did I go directly to the intellectual, safe, place? What am I not doing that's made me put on my lecture pants? (I imagine them to be an orange plaid.) Lecture-girl is usually guilt-driven (why yes, I have read emily freeman's "grace for the good girl" and I am doing the read-along too). What is it in "and it is in dying that we are born to eternal life" that scares me? Am I really dying to self? Am I really stepping aside and letting God lead me, guide me? When it comes to God versus the couch and potato chips, not so much. Before we get to the possible answers to these questions, let's segue and talk a bit about "eternal life". I grew up believing that "eternal life" meant heaven, and heaven was somewhere you went after you died. In the Gospel of John, Jesus prays in the garden and right in the middle of this prayer, he says, "Now this is eternal life: that they may know you, the only true God, and Jesus Christ, whom you have sent." (John 17:3, NIV). "eternal life" == "knowing God and Jesus Christ"
The heavily footnoted New Jerusalem Bible says that " 'knowledge' is not merely the conclusion of an intellectual process, but the fruit of an 'experience', a personal contact; when it matures, it is love." Love here being hesed (a fun word to say), often translated as "steadfast love". Eternal life isn't later, we can experience it now. Just by knowing God and Jesus Christ. 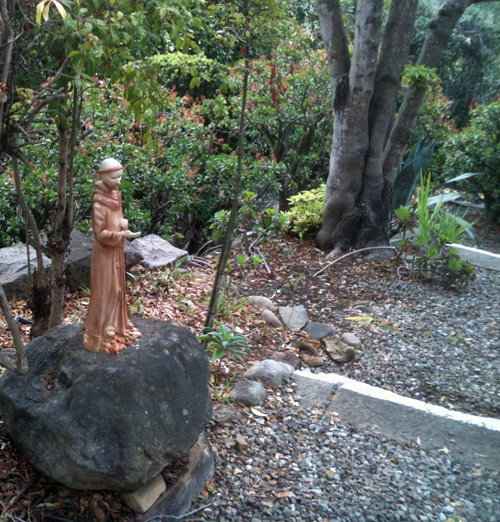 The Prayer of St. Francis repeats a certain formula. In the first part, we are giving. in the second part, we are denying something for ourselves in order to give. That it is more important to console, understand and love, than it is to have someone else console, understand and love us. This denial has been referred to as dying to self, which I think is about the hardest thing God can ask of us. To put God first, always. To walk in the Way of Christ and live as he lived: healing, helping, loving. Oh yeah, now I can see why I wanted to lecture. It's an impossible expectation that this "good girl" can't refuse and feels incredibly guilty that she isn't achieving some of these. (Emily freeman's book "grace for the good girl" explains so much better than what I'm about to summarize.) As a good girl, I seek to earn God's love, instead of accepting his grace and mercy. As a good girl, I see this as a rule, a duty, a requirement in order to be loved by God. And so I put on my lecture pants about the true meaning of words and phrases and try not to think of how far I need to go in fulfilling this "rule". But this is a prayer, not a rule. It's a call for the Kingdom of God to come here on earth through the gifts God has given us to be loving, compassionate, for we were made in God's image after all. We can each step into relationship and bring the knowledge of God's love for us through our actions, and it'll be unique for each of us who are uniquely created. And so it is in walking in this way, of replacing the dark with the light, of being a light, of letting another know that they are loved by God because you acknowledge their existence, their pain and you love them still. There, we get to experience God, to get a hint of what it is like to have the steadfast love he has for us, to feel in our skin why Christ died for us. It is all God wants of us. To know Him --and the ways expressed in this prayer can help us with that. May we pray it together?